On Sunday July 22, 2012 my friend and TAR partner, Sarah MacLeod and I organized/hosted a charity run for Cancer from Kelowna to Naramata. As part of our journey back to the Alps this year we wanted to do something more than just RUN. We wanted to give back to a community that was supporting us in making our return dream trip to the Alps come true. The journey started off at the end of Lakeshore Drive. We all met at 6am to get our gear organized for the shuttles to meet us in Naramata. Mother Nature was so cooperative and gifted us overcast skies and keeping temps out of the 30’s. Before we started the run, Sarah and I had goodie-bags for the runners with gummy bears, candy coke bottles (next best thing when you can’t have an aid station out there) and LIVESTRONG bands for everyone to run in. We all took 10min and anyone who wanted to share their story with why they choose to participate in the event could. We heard some very endearing and inspiring stories and some choose to simply share their belief in not giving up hope for a cure. It set a very strong bond and tone to the start of our epic adventure. The energy during the run was very high, despite the challenging terrain and sheer distance. Not one person complained about a thing. I think we all could have had mondo –blisters, chaffing etc… and we all still would have ran with smiles on our faces. This ‘unspoken’ gratitude was fueling everyone and truly made the day that much more rewarding. There was also a presence out there with us that is hard to explain. I think that was a result of and partially to do with the fact that everyone shared, openly, stories of friends and family members and their battles with the disease. It was almost like we had more than 13 of us out there and some even took photos of their loved ones and ran with them on their packs. The run itself was on the trails of Okanagan Mountain Park and totaled 32km and 4,200 feet ascent. We reached the outskirts of Naramata where our volunteer drivers picked us up, with a cooler of cold water and beer. We then finished our day with a dip in the lake and lunch in Penticton. The runners! For joining our fight and making it possible. Together we raised over $5000 and more importantly, brought a community together to make a difference. Sharing the day with all of you is something we will never forget. Jamie Arnett, Karen Christie, Ian Tanner, Nathan & Carrie Karsgaard, Ellen & Christopher Wilson, Stephanie Swaisland, Alana Jordan, Erica Abbie, Alison-Campbell Urness. Also Mrs. Kelly Hanson who joined the fight but unfortunately wasn’t able to make the run last minute as she prepared to go see her grandmother who is battling cancer back east. The volunteer drivers! Without you it would have been a long run back! AJ Jerome, Wade Christie, Trent, Ian Swaisland, David Urness and Melissa McCall. The donors! Thank you for supporting our event and for believing in a cure. Your support and belief is what gave us the inspiration to organize this and helped us complete our run. Alison Campbell Urness – for your fundraising efforts and special/additional event put on at Bertram Park. Also Jamie Arnett and Alana Jordan for volunteering on top of running/raising. GoodPeopleRun (www.goodpeoplerun.com) for shipping out a box full of their signature running BUFFS to help us give back for donations. If you haven’t already joined the ‘good people’ over there, sign up today to see how amazing this community of worldly runners are! We also had some very amazing sponsors in the community who are helping Sarah and I make this dream possible again: TITLE SPONSORS: Western Financial Group & True Outdoors. 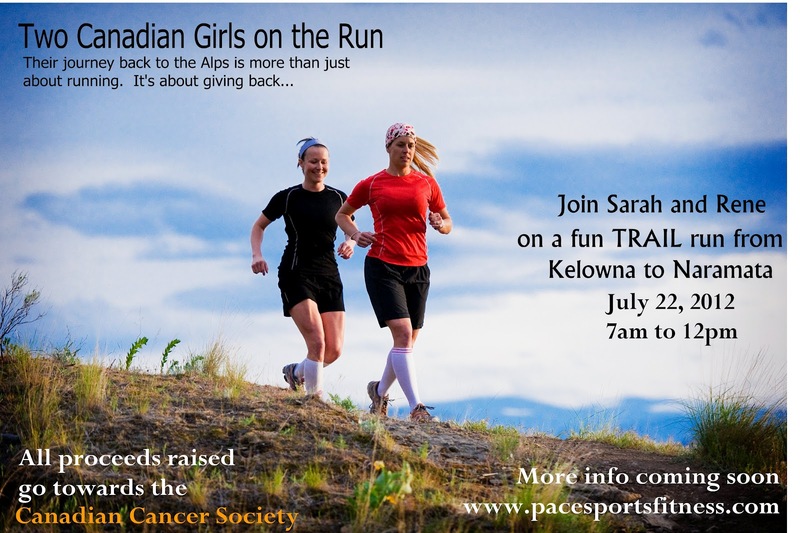 SUPPORTERS: Kelowna Cycle, Udos Oil and Icebreaker.